My son is five months and two weeks old. He has not yet rolled over in either direction. My pediatrician says babies who sleep on their backs are commonly delayed in rolling over. He also says that this could affect his schoolwork in later years. My son is happy and seems bright and receives a great deal of attention. Isn’t this more important than whether or not he can roll over? Will he really be learning disabled because he rolled over too late? What can I do to encourage baby motor skills development? The importance of a number of the milestones for normal motor development is that they build on one another. For example head control in an infant is important to be able to sit and ultimately to walk. Reaching for objects are necessary to be able to play with toys, explore, self-feed, and so on. 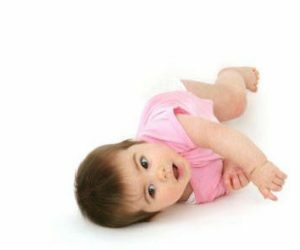 Although rolling over is typically achieved at 4 months or so, rolling over per se is not a necessary skill on which to build other skills. In an otherwise normal 5½ month old infant who holds his head well, reaches for objects, and is making progress in sitting, failure to roll over alone is of no concern. No scientific evidence exists linking delay in rolling over (by itself) and learning disabilities or poor school performance. Both of my best friend’s children (now ages 7 years and 4 years) rolled over at 8 months or so, in the face of otherwise normal psychomotor development.